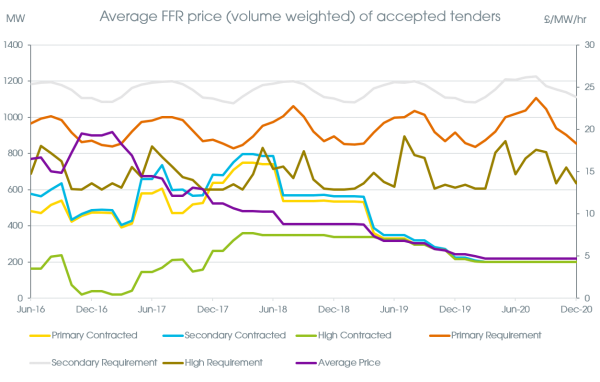 The slowdown in the Firm Frequency Response (FFR) market, where prices are falling and volumes have been capped – in large part thanks to the decreasing cost of battery storage – has been a big talking point of late. National Grid has now procured much of the low response it needs for the next two years, and average prices of accepted bids have decreased 20% over the last 7 months. National Grid has also announced proposed changes intended to rationalise and reform the current suite of balancing services it procures, including a streamlined FFR-type product. These rapidly changing market conditions may leave some battery companies going back to the drawing board and asking how to guarantee income over a long period and satisfy investors that it is worth investing hundreds of thousands in the latest battery storage system, without the relatively high revenues that providing FFR has historically guaranteed? But it is possible to turn to other markets for flexibility. FFR will remain a part of the revenue stream for batteries, and for the fast-acting Demand Side Response (DSR) that makes up most of Open Energi’s FFR portfolio; but being a bit smarter about where, and how, you employ the flexibility at hand can open up a wealth of other revenue streams. These, stacked up, provide a stronger business case than FFR alone. Open Energi’s new platform, Dynamic Demand 2.0, is designed with exactly this in mind. By connecting to distributed energy assets which have inherent flexibility in their electricity consumption or generation, including industrial equipment, electric vehicle charging stations, and of course battery storage systems, it enables businesses to dispatch this flexibility in the most valuable place at any one time. Tailored to the particular operational or site constraints of an asset, balancing services, energy trading, the capacity market, network constraint management, peak price management such as DUoS red-band and TRIAD avoidance are all opened up as stacked revenue streams, as well as operational energy efficiencies automated with machine learning. For behind-the-meter batteries, this means considering any on-site generation or demand, the import and export limits of the site, the warranty particulars of the battery, and evaluating all the potential revenue streams of the asset. By taking a holistic view of the energy market, using state of the art machine learning techniques and cloud based technology, we remotely operate the asset to maximise its return on investment: FFR is just one slice of the cake. In many ways, a battery is the perfect asset for flexibility. It has a defined storage capacity; it can discharge power up to a maximum well-defined rate; and it has a known state of charge (SoC) at any one time. However, to operate a battery across multiple markets, careful management of the SoC of the system is necessary. While batteries very naturally perform frequency response, charging up when frequency is high – removing excess electricity from the grid, and discharging when frequency is low – when more electricity is required, the operation is not quite that simple. To have the capacity, or availability, to both charge up and discharge in line with grid frequency, the ideal SoC of a battery is 50%. 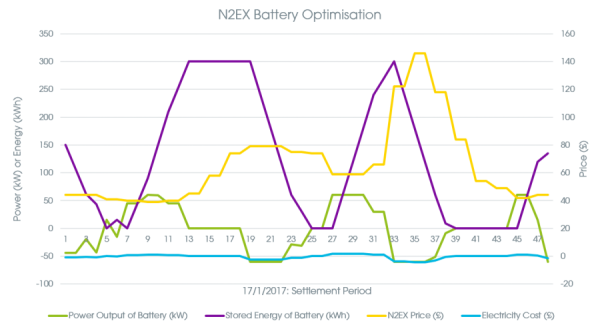 Periods of high or low grid frequency can rapidly take the SoC of the system far from 50%, and batteries have an inherent efficiency (around 90% in the best systems): active state of charge management is required to maintain the availability for frequency response. The figure below shows the same 500kW, 800kWh battery over the same 52-hour period, with and without state of charge management. The availability to fully charge or discharge at the capacity of the battery for 30 mins (equivalent to a frequency 50.5Hz or 49.5Hz for half an hour) – is quickly impeded on when no SoC management is present, and SoC will eventually tail off to zero due to the non-perfect efficiency of the battery. Battery throughput, defined as the cumulative discharge of energy through the battery, is also higher without SoC management, eating into that allowed by the warranty. Fig: The state of charge (%, top), availability for FFR (kW, middle) and throughput (kWh, bottom) of a 500kW, 800kWh system are shown across 2 days of frequency data. With no SoC management in action, state of charge is routinely out of the dotted lines which signify ½ hour of storage capacity being available to charge and discharge at full power; here, state of charge is low. As a result, low availability for FFR is diminished. 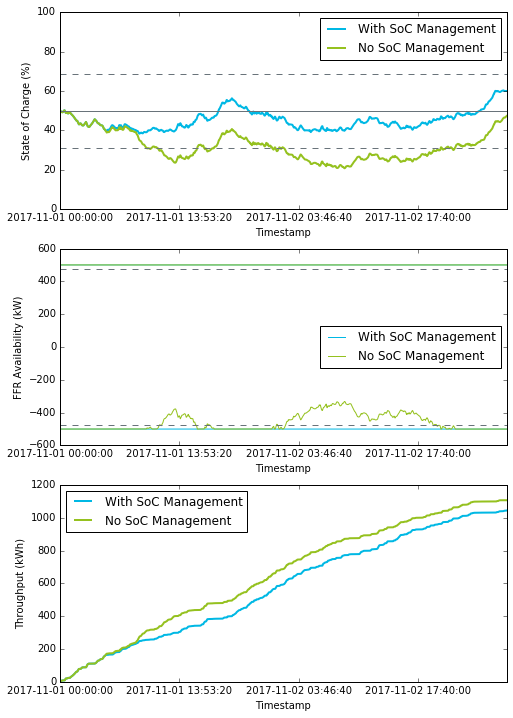 Throughput of the battery, defined as the cumulative sum of the battery discharge, is also higher when no SoC management is used. When introducing revenue streams in addition to FFR, as we do with Dynamic Demand 2.0, battery operation gets rather more complex. For a behind-the-meter battery, electricity bills can be significantly reduced by discharging over peak periods to either avoid importing electricity when it is most expensive (if the site has demand), or exporting to grid and taking advantage of the various network charging revenue streams (DUoS, TRIAD, CM Levy). Electricity generated earlier in the day, from on-site PV generation, or stored when it was cheap to import, can be exported to grid at peak times. Energy arbitrage on the wholesale market: charging up when the N2EX price is low and discharging when it is high, or hedging against pre-bought volumes, can give a day-ahead price signal, as in the figure below; playing on the intraday market can similarly offer additional uplift. If the asset owner is exposed to the Balancing Mechanism through their supplier, short notice calls to discharge in line with a large system imbalance offers another revenue stream. Fig: Energy arbitrage using the N2EX day-ahead market is shown for a 60kW, 300kWh system over one day. The stored capacity of the battery is varied to minimise the cost of electricity over the day, such that the battery charges when electricity is cheap, and discharges when it is more expensive. By layering on additional price signals closer to time and re-optimising the power profile, additional revenues from energy arbitrage across a range of markets can be achieved. These requests to charge and discharge in line with ahead-of-time and real-time price signals must be dispatched depending on the import and export constraints of the site and of the capacity of the battery. It needs enough stored energy to be able to discharge for the duration of the price spike, while maintaining the availability to do FFR in accordance with any pre-contracted volumes required by National Grid, and such that recovering the SoC afterwards does not cost more than earnings during the call itself. It also needs to do so without overly increasing the throughput of the battery such that the valuable warranty is violated. Open Energi has experience of doing this with assets already in operation behind-the-meter. 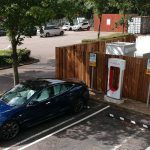 At South Mimms Welcome Break services, we are managing a Tesla Powerpack alongside an EV charging station, to displace site demand from EV charging throughout the day, while providing FFR, and providing energy savings by doing a full discharge of the battery during peak periods. 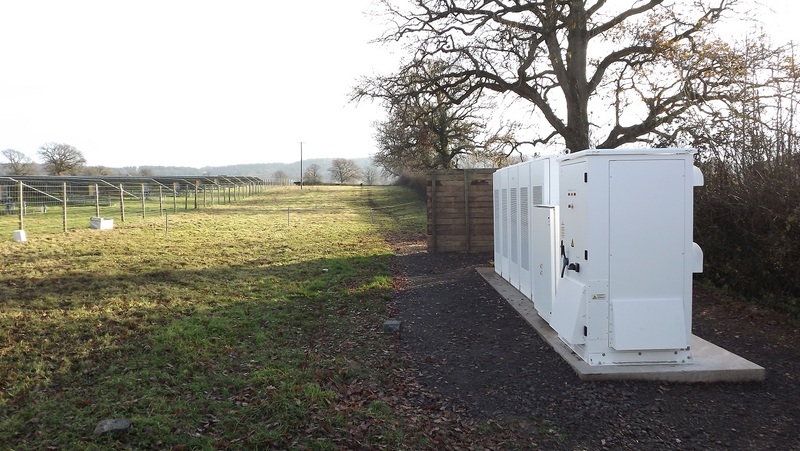 In a Somerset field, we operate a battery integrated with a solar farm, using PV generation to charge up the battery for free during the day, discharging at peak times, and managing the SoC so that FFR availability is maximised the rest of the time. By stacking these additional revenue streams alongside FFR we increase the income of the asset, and with our Dynamic Demand 2.0 platform, will be able to extend these services across a host of other assets and services. This includes managing fleets of battery storage systems, where the optimal control strategy goes beyond revenue stacking each asset individually. A central intelligence that is aware of the state of each battery can determine how hard to work different assets to maximise revenue or minimise the number of charge-discharge cycles performed, extending each asset’s life. Dynamic Demand 2.0 can combine revenue stacking with fleet management strategies to meet these objectives. As we look to the future of energy, it is clear that behind-the-meter battery storage has a huge role to play in creating a more sustainable system. As renewable energy becomes more prevalent, value is emerging in new places, and the key to optimising this value, without negatively impacting battery performance, is technology.